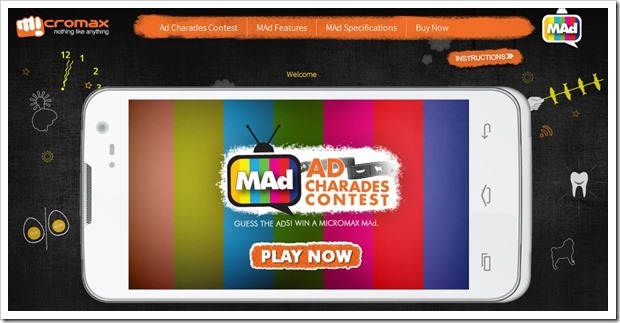 Micromax Introduces Canvas MAd, Incentivizes Users To Watch Ads On Phone. Will You Go For It? Ads are one of the strangest sources of revenue. The metrics to measure the efficiency of an ad is not perfect and the return on investment (ROI) is not direct like goods and services. However, they are one of the most potent streams of money and with Google earning billions just by ads, we can safely say that advertisement industry is a very robust one. All this, when you take a survey and most people would say that they hate ads or at least avoid them consistently. The reason I am coming up with this topic is because Micromax has (again) launched something unique in the Indian market. Micromax Canvas MAd was launched two days back and you can read about it here. 512 MB RAM and 4 GB ROM. The price of the phone is Rs. 8490 on their site. The interesting idea is that there are certain apps that will display ads and if the user watches those ads he or she will get points that will be added to their accounts. A person can then exchange them for money (both prepaid and postpaid, across operators). This means that people can get money for watching ads. There is another example, not yet in India but in US. Amazon offers its Kindle readers in two prices. One with ads (called offers) and another ad free with a price difference. Here, you get the profit immediately as the ad-free kindle is $20 pricier than with ad one. The difference is that in Micromax, you will have to watch ads consciously unlike in Kindle where they are present as screensavers. However, there is one thing common – the ads are non-intrusive. It depends on the user to watch those ads. So, my question is what do you think about this? Will people be interested in this? No one is going to be doing this in their busy time but many students might find this an interesting prospect- getting money for watching ads. Also, as the phone is under 10k, the people targeted are the ones who would also keep an eye on their balance. Is there a potential market for this in the higher end of the spectrum as well? Why Samsung Galaxy S3 will revolutionize Android’s battle for Supremacy? Android 2.3 mobile phones available in India!